I have gotten some really amazing comments from all of you who have entered my giveaway so far, thank you so much! I look forward to receiving many more suggestions on how to improve the blog. I am definitely taking your comments into consideration and planning on adding some things to the blog in the near future! Today I have a french mani that I wore earlier this week. I wanted to do a pretty light pink mani in support of Breast Cancer Awareness month this October. For these nails, I started of with a basecoat of NailTek followed by two coats of Sephora by OPI A True Romantic. Then I used Konad plate m19 using Konad Special White polish twice on each nail. I topped this off with a coat of Seche Vite. From there, my original plans changed a bit. I had been planning on using a darker pink polish for the embellishment, but I realized that my K-State Wildcats were playing our biggest rival, KU, in football the next day. I have a superstitions belief that my nails must be somehow purple for us to win. I don't really believe this, but it is fun and I usually try to do something purple for games. 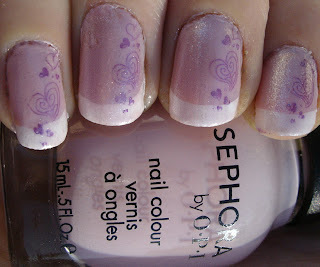 So I used OPI Funky Donkey and Konad plate m35 to put purple hearts on the nails. We completely crushed KU, if you are interested. :) After that, I decided the mani needed a bit of sparkle so I layers one thin coat of OPI Princesses Rule! and topped it off with one more coat of Seche Vite. Unfortunately, I was not able to take pictures right away and some damage happened to the mani before I was able to get pictures for the blog (like a polish smudge on my ring finger and a bit of a chip on my index finger). But it was still pretty and I actually wore these for three days afterward - a combination of loving the nails and being too sick to change them, heh. I did have some issues with using the Konad french tips, since they have to be fairly perfectly straight to look right, but I am pleased with the overall outcome and will be excited to use the plate again in the future! Please take the time this month, and all year, to think about those people who are fighting, have beaten or have lost the fight with breast cancer. If you are interested in donating money to the cause, here is a link to the donation page at SUSAN G. KOMAN FOR THE CURE. They are a fabulous organization that funds a lot of brilliant research into treatments for breast cancer. Coming from a cancer researcher, thank you so much for any donations you are able to give. They are very much appreciated! I think you did a beautiful job. I just posted my mani for this cause, but I would love to do one with designs on it. Congrats on getting Manhattan 610K can't wait to what you have in store for it. Thanks! There were a lot of components for one mani, I was hoping I could pull it off without it looking like too much.